Chili benefits the health by burning toxins from the colon. Moreover, regular consumption of chilies reduces the amount of insulin required by the body and hence, helps lower blood sugar levels after eating. Chilies have a hot, pungent flavor as they contain a substance called capsaicin. The herb has sweet and hotter varieties. Thus, chili has a stronger and more pungent flavor than chili pepper, also known as capsicum. This spice originated in West Indies and tropical America. It is used in both fresh and dried forms. Chili belongs to the Solanaceae family. Chili has anti-inflammatory, antispasmodic, rubefacient, stomachic, depurative, antibacterial, antifungal, sialagogue and stimulant properties. Chili benefits in providing relief from pains without causing any numbing effect. Hence, it can be used for reducing pains associated with arthritis, diabetic neuropathy, bursitis, etc. This herb is useful in preventing the formation of blood clots. Another benefit of chili is that it aids in clearing congestions by causing secretions that induce runny nose and sweating, in turn. Furthermore, it dilates the lung sacs and hence, helps in the controlling asthma. Interestingly, as hot peppers can make you sweat, they can help you cool off due to perspiration. They are also useful in relieving headaches and migraines. Furthermore, chilies benefit in dealing with diabetes and reducing the risk of type 2 diabetes as they improve insulin regulation. Here’s an interesting video giving information on chili health benefits. Plus, regular consumption of chili controls blood pressure and lowers cholesterol, thereby aiding in keeping your heart healthy. It is worth noting that culture where this spice is used generously, have a lower rate of strokes and heart attacks. Moreover, it is believed that this therapeutic herb can help avoid the spread of prostate cancer. Chili stimulates circulation, purifies blood, and boosts the immune system. Moreover, it is considered good for losing weight. Cayenne pepper, in particular, facilitates weight loss. Hot chili peppers help in getting rid of digestive problems like indigestion and flatulence as they stimulate the secretion of saliva and gastric juices. Contrary to the popular misconception, chili peppers prevent stomach ulcers. 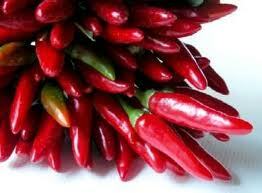 In terms of nutrition, chilies are rich in vitamin A, vitamin B6, vitamin C, magnesium, potassium, iron and protein. The chemical capsaicin present in this herb (mostly in the seeds and white inner portion) stimulates the brain to release endorphin that makes you feel good when you eat chili. It is not exactly an addiction, though, because it does not induce chemical dependency. Excessive consumption of this herb, however, may cause mental disturbance. • Put ten roses in cup of water and boil the solution. Strain it and add about three pinches of red chili powder. Use this solution for gargling when it is comfortably warm to get rid of throat irritation. • Simply gargling with a solution of water mixed with half a teaspoon of dried chili powder is helpful in treating sore throat. 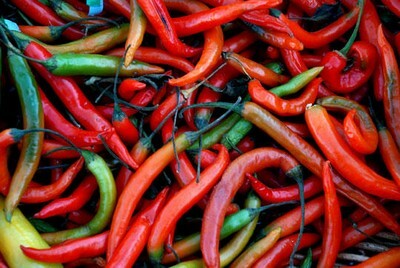 • Consumption of red chilies and having soups containing hot chili peppers and chili powder helps heal sinus infection. • SautÃ© dry red chili along with a handful of curry leaves and add a pinch of tamarind and salt. Grind this mixture and put some water in it, sufficient to form a paste. Mix this paste in hot rice and consume it to cure digestive disorders such as bloating, diarrhea, nausea and vomiting. • To get rid of gas and flatulence, prepare a remedy by adding half a teaspoon of red chili powder, and a pinch of black salt and cumin seed powder. Take one teaspoon of this mixture along with a glass of warm water. • Another natural treatment for nausea is to prepare a paste of one green chili, add half a teaspoon of camphor and two teaspoons of lime juice in it and consume a quarter teaspoon of this mixture. It may cause burning sensation. Thus, it is suggested to follow this procedure only in case of severe nausea or diarrhea. • To derive analgesic benefits of chili, add fresh ginger and a teaspoon of red chilies in half a cup of warm sesame oil. Rub this oil on the joints to heal arthritis pain. Moreover, when dealing with rheumatoid arthritis, you can prepare a home medicine by putting 100 g dried chili pepper in a mixture of 600 ml water and 750 ml whisky, vodka or brandy. Store the solution in a cool place for a week. Finally, soak a cotton ball in it and apply on the affected areas three times in a day. Follow this therapy for a couple of weeks. • Taking a glass of warm water mixed with a quarter teaspoon of cayenne pepper powder serves one of the best chili home remedies for losing weight naturally. • When dealing with toothache, apply a mixture of clove oil and chili powder on the affected area. Besides, you can soak a cotton ball in some cayenne pepper oil and apply it. 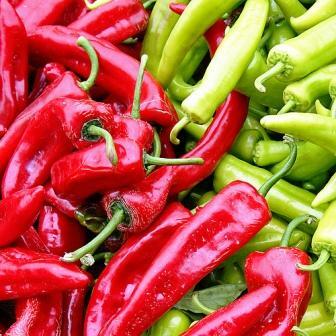 Having a tablespoon of green or red chilies can improve your metabolism rate by almost 20% for about half an hour. The increased metabolic rate can aid in losing weight. While following a detoxification procedure, you can consume a glass of water mixed with 1/10 teaspoon cayenne pepper, eight tablespoons lemon juice and two tablespoons maple syrup (Grade B). When working with hot chili peppers like jalapenos, it is suggested to wear thin rubber gloves to avoid burning sensation. In case you are not using gloves, make sure you wash your hands thoroughly after chopping chilies. Application of rubbing alcohol helps reduce chili burns. Excessive consumption of this herb can lead to issues like gastroenteritis and kidney damage. Individuals suffering from inflammatory conditions such as acid reflux disease, gastritis, ulcers, etc. should avoid having chilies. Chili benefits the health but tends to cause heartburn at times. Thus, you can have milk or yogurt after eating chilies because the protein casein in milk helps prevent and cure heartburn. Prolonged use of chili on skin can lead to dermatitis.